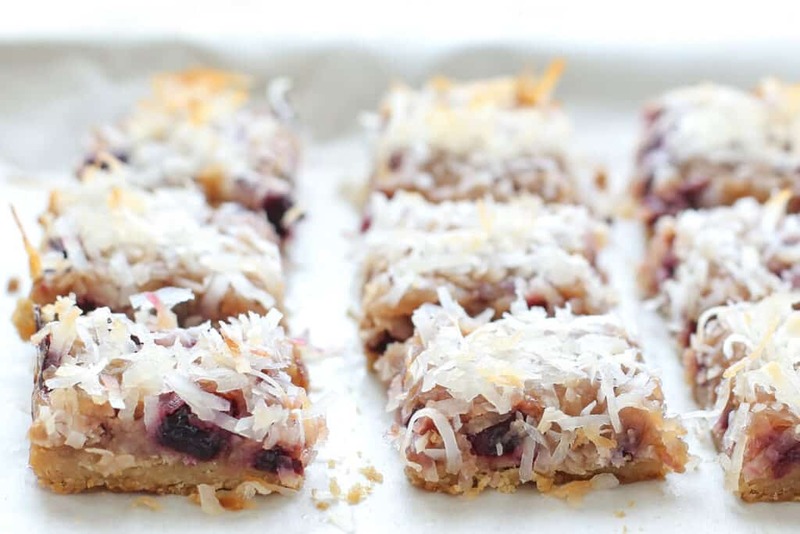 Fresh cherries and coconut are baked into a gooey, sweetly tart filling over a crisp shortbread crust. These bars were a huge hit with friends and family when I made them and there wasn’t a single bar leftover. With fresh cherries finally in abundance, I’m making the most of them while they last. The season (read: the inexpensive cherries) will only last a few weeks and we’ve been eating cherries almost every day. For more cherry inspiration, check out a few more great recipes! 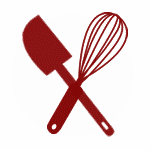 * Substitute 1/3 cup tapioca starch plus 2/3 cup brown rice flour for a gluten free recipe. ** Substitute 1/4 cup brown rice flour for a gluten free recipe. Preheat the oven to 350 degrees. Stir together the butter, sugar and flour for the crust and press the mixture into the bottom of a well-greased or parchment lined 10” square pan. Doubling this recipe will fill a 9x13 pan. Bake for 12 minutes (or 15 minutes for a doubled recipe). Remove from the oven and let the crust cool for 10 minutes while preparing the filling. 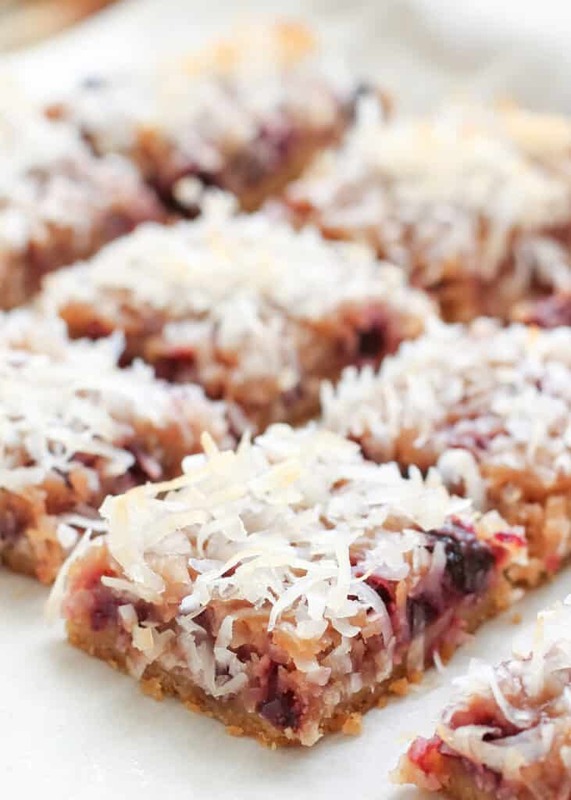 Place the diced cherries and 1 cup of shredded coconut in a bowl. Sprinkle with flour, brown sugar and salt. Stir to coat. Mix together the eggs, almond extract and lemon juice and stir into the cherry mixture. Pour the filling over the crust and top with the remaining coconut. Bake for 25-27 minutes, until the coconut turns golden brown. Let cool completely before slicing. Enjoy! If you would like to double this recipe, it will fill a standard 9x13 pan. You can make this recipe in an 8, 9 or 10 inch square pan. Simply increase the cooking times by a minute or two for slightly thicker bars in the smaller size pans. If you decide to double the recipe, the bars freeze well and thaw perfectly in less than an hour. These looks delicious Mary! I've been looking for a recipe to use up the cherries I have! These are fantastic! 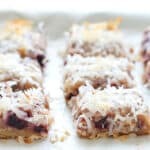 I subbed in unsweetened coconut flakes rather than the sweetened shreds, and just sprinkled some muscovadomsugar on top to accent the sweetness - theyr'e jammy, tart, sweet without going overboard, and I love the texture! I just made them. They taste great but a word of warning.. I used two cups fresh whole cherries. It was too much. The filling was soggy. I will make this again but will make sure I measure exactly 1 cup diced cherries. These are so yummy and easy to make. Finally found a keeper recipe for all those fresh picked cherries.